What changes make the 2018 Subaru Outback different? Revised styling, expanded safety features, and upgraded connectivity freshen one of America’s most underrated midsize crossovers. They’re the biggest changes to Subaru’s five-seat wagon since its model-year 2015 redesign and should sustain it until the next all-new version is launched, for model-year 2020. Outback continues with a choice of four- and six-cylinder engines and again comes standard with all-wheel drive (AWD). The 2018 appearance revisions are subtle but effective and contribute to a slightly more rugged-looking Outback. The driver-assist enhancements are minor, too — steering-linked headlights are newly available, for example – but they do burnish the appeal of a vehicle that already earns top safety ratings. And faster-acting infotainment interfaces with larger touchscreens are a welcome connectivity advance. Outback is Subaru’s largest and most popular vehicle, outselling the compact Forester. The revamp should help sustain healthy demand even as it nears the end of this design generation. Indeed, sales continue to outperform the midsize-crossover segment, climbing 3.6 percent in the first quarter of 2018, against a 1.2-percent gain for the class as a whole. Through the first quarter of 2018, it ranked fourth among some 20 entries in the midsize-crossover class, trailing only the Ford Explorer, Jeep Grand Cherokee, and Toyota Highlander. Come model-year 2019, however, it’ll face yet another addition to the segment — this one from within Subaru’s own lineup no less – as the automaker introduces the Ascent, a midsize crossover that’ll seat up to eight. Because the model-year-’18 updates strengthen Outback’s standing as a pleasantly rational substitute for a bulkier crossover. Even after this year’s revised styling, most competitors continue to look more macho but few can match Outback’s off-road prowess. And despite a low roofline by midsize-crossover standards, headroom is plentiful and cargo volume exceeds the likes of the Nissan Murano and Jeep Grand Cherokee. The comparatively squat profile is evidence of a relatively low center of gravity, which contributes to carlike stability. Fuel-economy ratings are among best in class. Resale value and safety ratings are top notch. And with Subaru Active Torque Split AWD and sensible tires standard, every Outback has fantastic traction and handles great in the snow. The 2018 lineup is unchanged. Four-cylinder models are again grouped under the 2.5i banner and come in Base, Premium, Limited, and Touring trim. Six-cylinder offerings again wear the 3.6R badge and come in the Limited and Touring grades. Not if you find the ’18 model to your liking. The ’19 will be its near mirror image but almost certainly will cost more. And with the redesigned 2020 Outback in the works, the ’19 will have just one season to look current before the nameplate gets a new body and underskin structure, plus next-gen features and powertrains. On the upside, the ’19 would likely be available at clearance-sale prices as dealers begin to make room for the all-new ‘20s. One motive a Subaru loyalist might have to delay the purchase of a 2018 or ’19 Outback is the chance to audition the 2019 Ascent. It’s Subaru’s second attempt at a more traditional midsize crossover, following the poorly received 2006-2014 Tribeca (called the B9 Tribeca from ’06-’08). Ascent has three rows of seats and is longer than the Outback by 7.2 inches, taller by 5.5, and rides a wheelbase (distance between the front and rear axles) longer by 4.9 inches. It’s more expensive, too, with an announced base-price range of $32,970-$45,670, including destination fee. Outback’s estimated 2019 base-price range is $27,000-$40,000. 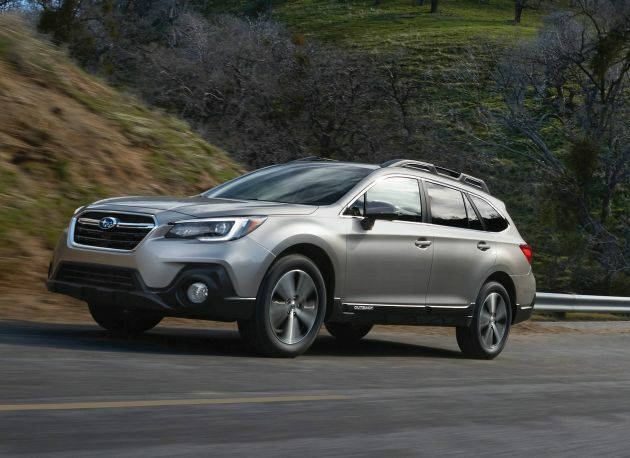 Ascent continues Subaru’s tradition of standard AWD and a horizontally opposed engine design, although unlike today’s Outback, it won’t offer a six-cylinder engine. Instead, it introduces the brand’s new turbocharged 2.4-liter four-cylinder. At 260 horsepower and 277 pound-feet of torque, it’s more powerful than Outback’s six and could well replace it in the next-generation Outback. Yes, although it’s within the bounds of a traditional midcycle facelift. Dimensions are unchanged and the main body is unaltered. The brand’s hexagonal grille is back, too, but it’s in a revamped nose with lower cladding designed for better protection from mud and stones. The grille is flanked by reshaped headlamps that are the most effective visual change. Their illuminated c-shaped outline blends with the new fascia’s horizontal character lines for an impression is of greater overall width. And in a neat touch, the headlamps’ bar-and-circle interior elements suggest the piston motion of Subaru’s boxer engine design (see the “powertrain” section below). Rounding out the changes are reshaped mirrors designed to reduce wind noise, and for the Limited, new wheels with high-contrast spoke/rim coloring. Even with the facelift, this generation Outback continues to look more like an inflated station wagon than a pretend-truck SUV. Indeed, it shares its basic structure and mechanical components with the Subaru Legacy midsize sedan. Don’t be deceived, though. In this class, only the Grand Cherokee and Toyota 4Runner beat Outback’s 8.7 inches of ground clearance. Yet, the Subaru’s step-in height is modest. And with its generous legroom, four adults ride in terrific comfort and a fifth is not unwelcome in a pinch. Visual differences among Outback’s trim levels remain minor. The 2018 Premium grade again builds on the Base version with fog lamps, privacy rear glass, and body-colored instead of black mirrors. All models have alloy wheels, 17s on Base and Premium, 18s on Limited and Touring. Those top two versions also have side mirrors with integrated turn signals, Base, Premium, and Limited have roof rails that incorporate innovative integrated retractable crossbars. The Touring has its own low-profile rails in a silver finish with available detachable crossbars. Speaking of roof racks, Outback’s step-shaped doorsills form a stable perch when you’re loading, underscoring Subaru’s attention to functional detail. Additional noise-reducing measures include insulated front side glass. And all ’18 Outbacks receive upgraded cabin materials, as well as a more upscale steering wheel. The highlight here is larger display screens for Subaru’s Starlink multimedia system, to 6.5 inches from 6.2 on the basic setup and to 8 inches from 7 inches on the more advanced system available on Premium-level trims (see the “new features” section below for additional Starlink upgrades). Two USB power points are added to the back of the center console for rear seaters. The temperature-control dial now displays the temp-setting readout, and the dashboard clock is larger. Gray joins black and ivory as an interior-color theme. Limited and Touring continue with perforated leather upholstery, and faux-wood cabin accents. The Touring was added for model-year 2017, supplanting the Limited as Outback’s flagship. It follows today’s dark-trim trend with black side cladding and a deep-gray-tinted grille and wheels. Inside, the Touring’s exclusive silver trim, gloss-black control bezels, and ivory-stitched Java Brown leather upholstery are upscale but not ostentatious – just right for a Subaru. Yes, in the form of some well-calculated tweaks to suspension, steering, and transmission. Retuned dampers give a smoother ride; recalibrated brakes a more direct feel; and adjustments to the electric power steering system yield smoother, more linear response. Outback’s wagon-like profile – no rival has a lower roofline – and the center-of-gravity-favoring design of its pancaked engine layout, help it change direction with an immediacy and stability unmatched by anything in its competitive set. The 2.5i line reprises a 2.5-liter four-cylinder engine with 170 horsepower and 174 pound-feet of torque. A few other midsize crossovers offer four-cylinder engines, but they’re typically limited to front-wheel-drive models. 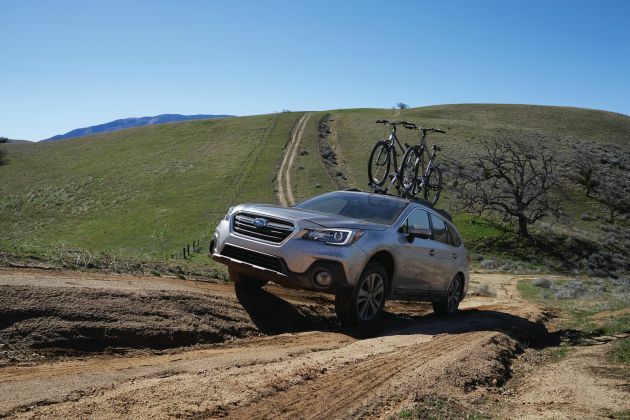 Even with its standard AWD, Outback’s four-cylinder furnishes adequate acceleration, thanks in part to the Subaru’s relatively light 3,600-pound curb weight. Outback 3.6R models retain a 3.6-liter six-cylinder with 256 horsepower and 247 pound-feet of torque. The sixes in most rivals have more power and torque, as do the increasing number of turbocharged four-cylinders in this class. But even 3.6R Outbacks weigh a couple hundred pounds less than comparably equipped crossovers, so they deliver very satisfying get-up-and-go. Both engines utilize the Japanese automaker’s space-saving “boxer” layout, meaning their cylinders are horizontally opposed rather than arranged vertically inline or in a “v.” And both again mate with a continuously variable transmission. A CVT plays the role of a conventional automatic transmission but doesn’t have stepped gear ratios. Outback’s CVT comes with steering wheel shift paddles that give drivers some manual-type gear control. For ’18, the number of “step shifts” increases to seven, from six. And in the 2.5i models, changes to engine and CVT internals reduce noise during acceleration, although not enough to erase the engine drone during rapid acceleration that’s a characteristic CVTs. Part of the problem is that Outback’s four-cylinder engine is technically out of step, lacking the smoother efficiency of direct fuel injection. Note that Subaru upgrades this 2.5-liter for the redesigned 2019 Forester, giving it direct fuel injection and increasing output to 182 horsepower and 176 pound-feet of torque. Look for something similar in Outback’s future. All Subarus except the rear-wheel-drive BRZ sports coupe come with an AWD system tailored to their market segment and price point. Outback’s boasts torque vectoring, which aids handling by distributing power laterally as well as longitudinally. It also has the automaker’s X-Mode programming, which bolsters off-road grip and control. In all, it’s a sophisticated setup that can gets an Outback through terrain that would alarm many of its owners and embarrass lots of trucky-looking rivals. EPA ratings are unchanged, so the ’18 Outback continues with higher mileage than most competitors with similar power. Thank the CVT and the aerodynamic efficiencies of a body profile that’s more car than truck. The 2.5i models also have active grille shutters that automatically open and close to manage wind resistance. The 2018 Outback 2.5i line rates 25/32/28 mpg city/highway/combined and the 3.6R models 20/27/22 mpg. Yes, but mostly upgrades to a roster of standard and optional features that was already quite comprehensive. A highlight is Subaru’s EyeSight safety system, which was standard for 2017 on the Touring model, optional on the Limited and Premium, and unavailable on the Base 2.5i. This laudable driver aid includes autonomous emergency braking designed to automatically stop the crossover to prevent a frontal collision. That capability earns EyeSight-equipped Outbacks coveted Insurance Institute for Highway Safety (IIHS) Top Safety Pick+ status. EyeSight also includes adaptive cruise control to maintain a set distance from traffic ahead, steering-linked fog lamps, and autonomous braking to prevent a collision while backing up. It also incorporates lane-maintaining automatic steering, which for ’18, activates earlier, at just above 37 mph. Touring models and Limiteds with EyeSight have high-beam assist, which automatically turns on the high beams to illuminate dark roads and turns them off as a courtesy to oncoming traffic. Ordering EyeSight on a 2.5i Premium adds blind-spot detection with rear cross-traffic alert, which is standard on the Limited and Touring. For ’18, Touring models and the 3.6R Limited gain steering-linked headlights in conjunction with newly available LED headlamps. All Outbacks come with a rearview backup camera; for ’18, it gains guidelines that move in sync with the steering. Also new for ’18, the tire-pressure-monitoring system now detects pressure changes at individual tires, rather than simply illuminating an icon that doesn’t identify which tire is low. Automatic locking doors are new. And Subaru says improved LATCH anchors make child-seat installation easier. Subaru’s Starlink connectivity platform is standard on every model and benefits from 2018’s move to larger screens and software changes the automaker says results in quicker performance. The version on the Base 2.5i grade integrates entertainment apps, smartphone mapping, and Bluetooth linking. The version on the other Outbacks adds a touchscreen with pinch-and-swipe control and hands-free SMS text messaging; it gains smartphone-like operation for ‘18. Voice recognition is again standard, and Subaru claims a significant improvement in response because it now uses two microphones and technology by Nuance, maker of Dragon Dictation apps for computers and other devices. Subaru says the driver can more easily use Apple Siri or OK Google voice commands, and that the system is compatible with multiple languages. Again optional on Premium and Limited and standard on Touring models is imbedded GPS navigation and a moonroof. A power liftgate is standard on Limited and Touring and optional on the Premium. We’d like to see the convenience of keyless access with pushbutton ignition migrate beyond just the Touring, where it’s been standard, and from the Limited, where it’s been optional. They climb, by an average of about $380 for the 2.5i line and $490 for the 3.6R line. Base prices in this review include Subaru’s $915 destination (up from $875 for the 2017 Outback). The 2.5i Base model is priced from $26,810 and the 2.5i Premium from $28,910, making them again some of the most affordable AWD crossovers this size. Every ’18 Outback again comes with standard features expected in this class, including a rearview camera and power windows, locks, and mirrors. The Premium expands on that with the previously outlined connectivity and convenience features, plus heated front seats and mirrors, a windshield-wiper de-icer, dual-zone automatic climate control, a leather-wrapped steering wheel, and a power driver’s seat. With a base price of $33,610, the 2.5i Limited may be Outback’s top overall 2018 value, particularly when equipped with EyeSight. This four-cylinder model includes all the aforementioned features, plus a power passenger seat, heated rear seats, and blind spot detection with rear cross-traffic alert. Although the 2018 2.5i Touring again comes fully equipped, at a starting price of $37,405, it remains pricey for a midsize crossover with a four-cylinder engine of modest output. The 2018 3.6R Limited and Touring models exchange xenon low-beam headlamps for LEDs, and they have dual exhausts. Otherwise, they duplicate the features of their 2.5i counterparts. The 2018 3.6R Limited is priced from $36,310. At a base price of $39,605, the 3.6R Touring again starts thousands below flagship versions of any other crossover in its competitive set, although most of those rivals have far more powerful engines. Subaru groups options in a fairly simple manner. None is offered on the 2.5i Base model or the 3.6R Touring. The 2.5i Premium is available with a $1,695 package that adds a moonroof, a power liftgate, and an automatic-dimming rearview compass mirror with Homlink remote controls. It also offers EyeSight and the power liftgate in a $1,995 package, and groups EyeSight, the moonroof and power liftgate, and GPS navigation for about $3,590. The sole 2.5i Limited option bundles EyeSight with reverse automatic braking, navigation, and xenon headlamps for $2,085. The 3.6R Limited’s only option consists of Eyesight with auto-reverse braking, navigation, and automatic high-beams for $1,585.